I wholeheartedly recommend this book to anyone who reads and enjoys non-fiction crime books as I found it gave a fascinating insight into one the most notorious crimes of the last century. 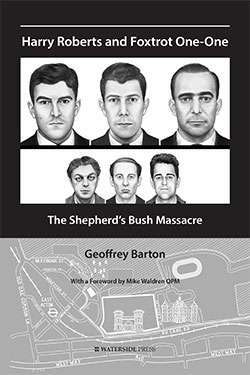 Harry Roberts, John Duddy and John Witney, shot dead three police officers on the streets of Shepherd's Bush in August 1966 and this book goes into great detail about the murders. Harry Roberts and Foxtrot One-One also looks at the changing face of policing, from the unarmed bobby of the 1960s until today, and the feelings of reassurance we may get when we are passing through airports and see the presence of armed police officers. I also have personal connections with this case as in the late-1970s I served time with John Witney - his cell was on my landing, and we worked in the prison laundry together. He was, like me, a petty criminal as back in 1966 I was a young tearaway in South London. I would frequent the same watering holes used by the Krays and the Richardson brothers' associates. Also like myself, Witney was a heavy drinker and pill popper. We were like pilots - these are small fish who eat parasites off the backs of sharks, but the sharks in our case were very violent criminals. Witney told me that Duddy and Roberts were very charismatic, but more so Roberts, and he was also aware that both of them had reputations of being violent. Witney was the wheels man and as the three were driving around, in Witney's words they were looking for a 'bit of business'. He candidly stated that he was fully aware that Roberts had a bag containing three pistols but went on to say that he didn't think for one moment that they would be used. But the rest is history. The three CID officers pulled them over for not having tax on Witney's car. The next step was utter tragedy. At their trial, all three of them were given life sentences with a tariff of 30 years, Roberts for killing two police officers, and Duddy for killing the other. Witney received the same sentence on the grounds of Joint Enterprise, or Common Purpose. After reading this excellent book, on a blustery and bright autumn afternoon, I stood at the spot in Braybrook Street, Shepherd's Bush where the three police officers were gunned down, and looking down at that street a feeling of gratitude came over me, that my life didn't go down the same path as John Witney's, which it so easily could have done. Geoffrey Barton's book is highly recommended for anyone who has an interest in crime, or for criminology students - it is a must read!